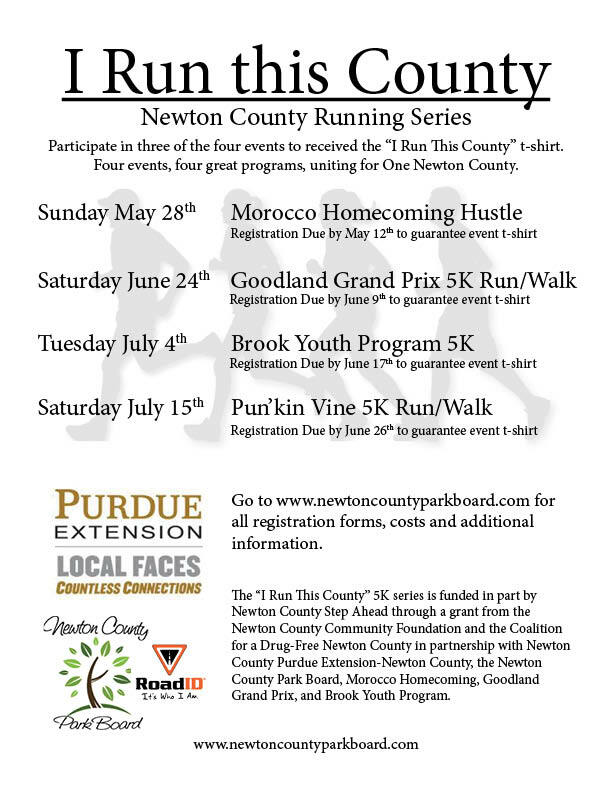 The “I Run This County” 5K Series consists of four runs at four different local events, the Morocco Homecoming, the Goodland Grand Prix, the Brook 4th of July and the Newton County Punkin’ Vine Fair. Participate in three of the four events receive an “I Run this County” t-shirt. It is funded in part by Newton County Step Ahead through grants from the Newton County Community Foundation and the Coalition for a Drug-Free Newton County in partnership with Purdue Extension-Newton County, Morocco Homecoming, Brook Youth Program, Goodland Grand Prix and Newton County Park Board.